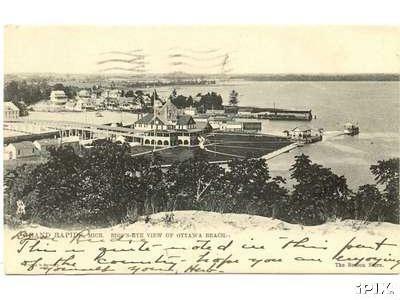 By the end of the 1870’s, the Chicago and West Michigan Railway had connected Holland with Grand Rapids so visitors could easily take a train out to Holland and catch one of several excursion steam boats out to either Ottawa Beach or to Macatawa Park for a pleasant day trip. In 1899, the Pere Marquette Railroad was formed, acquiring the assets of the Chicago and West Michigan Railway. C. M. Heald became the president of the P.M. Railroad. 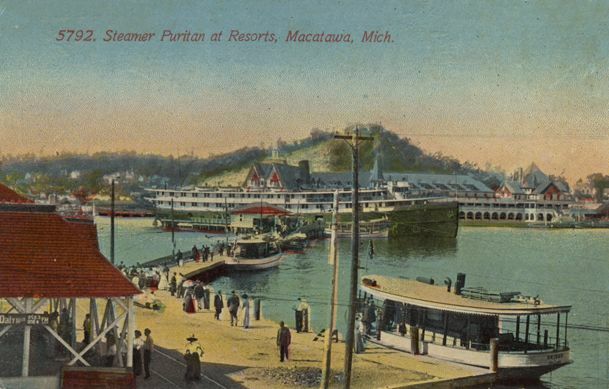 In 1900, PM announced plans for the expansion of the hotel, which by this time had been moved about 400 feet down a gentle sand dune to the shore of Lake Macatawa. The addition would add 185 guest rooms, only 32 of which had private bathrooms. The 1906 photo shows the Annex on the far left connected to the hotel by the elevated walkway over the railroad tracks. Eventually steam locomotives and rail cars took visitors and residents to Ottawa Beach as a second option in addition to the Black Lake boats. The electric interurban line connected to Jenison Park and Macatawa Park on the south side of Lake Macatawa.